MK Amsalem: only few hareidim deserve exemption from military or national service. Prime Minister Binyamin Netanyahu said Monday that all Israeli citizens should take part in serving the country, through the military or by other means. "I am committed to a more egalitarian division of the burden, and I have said this before," Netanyahu told the Knesset's Foreign Affairs and Defense Committee. "I believe in this and I believe that the equality on sharing the burden must include all of Israel's citizens – including the hareidi and the Arab sectors – and I believe that there is a way to achieve this." "I hope we succeed to solve this during our current efforts," he added, "but eventually it will be achieved. One way or another this thing will be achieved, because the state of Israel needs a more egalitarian division of the burden." 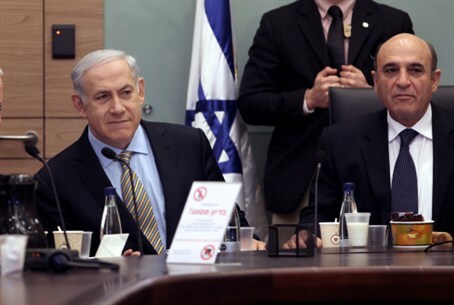 Finance Minister Yuval Steinitz said Monday that he opposes conscripting hareidim to the military by force. "The country's most essential and urgent need," he said, is integrating the hareidim into the work force, before anything else. "If in the next 10 to 20 years there is no ongoing process enlarging the participation of hareidim in the work force, the economy will suffer and the market will not grow by 4% or more." MK Haim Amsalem, who split from Shas to create the Am Shalem movement, said that only few hareidim deserve exemption from military or national service. "Torah and making a living go together," he told Voice of Israel radio. "The Rambam said that a man should devote one third of his day to Torah and one third to work."